Egelston Maynard Sports offers a wide range of products and services. ﻿Egelston-Maynard Sports is one of the leaders in Team Sales in the Covington, KY area. We offer a tremendous selection and huge inventory of uniforms, apparel, footwear and equipment giving you the peace of mind that your players will be suited up and equipped before the season starts. Locally owned and operated, Egelston-Maynard Sports has been providing top quality products and service to the team wear sectors for years. We have developed excellent working relationships with a variety of local, national and international suppliers to offer you a wide range of selection to meet your needs. Special Team promotions, Team Pricing, Volume Discounts, along with the best selection of quality gear and dedicated Team Sales support make Egelston-Maynard Sports the best value for those who purchase for teams, schools and sports organizations. Our Team Sales Representatives can help you customize or design your uniforms, caps, performance/workout apparel, and team footwear. We offer the finest quality screen-printing, embroidery or tackle twill services with quick turnaround times! At Egelston-Maynard, we recognize the importance of rewarding those individuals who strive to challenge the rigors and spirit of competition. Their journey is not only a process, but a reward rich in character development and personal growth. Throughout each school year, we hope to provide your participants with that special award to celebrate their accomplishments. A letterman jacket or varsity jacket represents academic and athletic accomplishment at the high school and college level such as earning a varsity letter. Whether you already have your chenille letters, patches, emblems, or numbers, you can rest assured that when you order a letterman jacket from us, you are getting the highest quality product available! Each coveted item will be cherished by the recipient for years to come. ​Embroider logos and designs on your garments or those purchased through us. Business or work polos are among the many items we can embroider and personalize for you. Bring us your artwork and we will take it from there or allow our graphic designer to create something for you. Monogramming and personalization available on your favorite shirts, blankets, towels and so much more. Makes the perfect gift! Egelston-Maynard has been supplying trophies, plaques, medals and awards to the local community for many years. 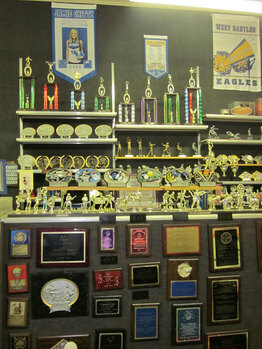 We feature the largest selection of sport and academic trophies, medals, plaques, and more. We have trophies for everything from your fantasy football league to back-to-school awards to motivate your students. We are known for fast processing, low prices, and quality service. Give our team a call at 859-581-6648. When you call you will find helpful, friendly award professionals who will help you select and design that perfect award. Do You Enjoy Discounts and Deals?